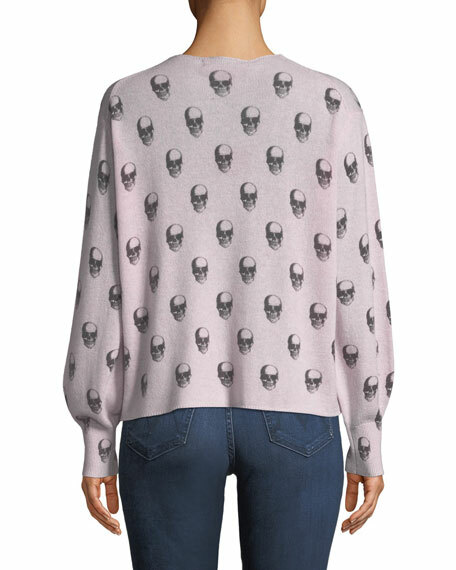 360Cashmere "Penny" sweater with allover skull graphic. 360Cashmere creative director Leslie Gifford has come "full circle" with a sophisticated collection of knitwear and accessories. Combining a California contemporary aesthetic with New York sophistication, she presents a sweater collection that will greatly impact your wardrobe. Although focused primarily on cashmere, the collection also features other fine yarns such as angora, wool cashmere, silk-cashmere, and linen in various gauges and weights.